Perhaps a future location for a wilderness survival reality show. In our continuing examination of Omaha’s Metro Route 22, and its bizarre bus stops, we examine this particular gem at 108th and Charles. Far from the wilderness outpost the above photo leads one to believe, this stop is across from a dense suburban neighborhood and an apartment complex, and just up the road from a major commercial center. 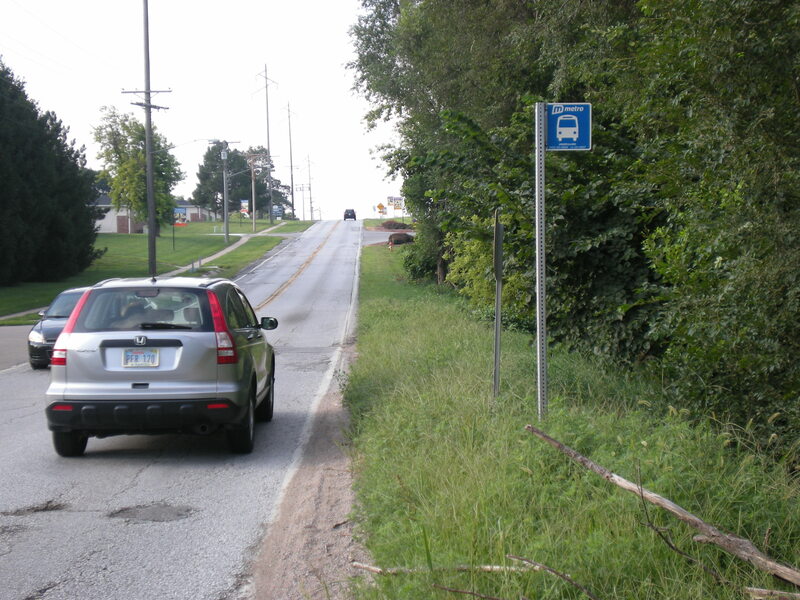 While woods, creeks, and tall grass are pleasant features to a landscape, they are not the ideal backdrop nor setting for an accessible transit pick up and drop off location. On the day I photographed the stop, I did see a rider board at this stop, but he did not wait there. Instead, and I imagine this is common practice, the rider waited on the opposite side of the street to hail the bus and only crossed over when the bus had effectively stopped south bound traffic. On hot days, transit riders are cooled by the wind whipped up by passing cars. From the photo above, you can see there is no shoulder, much less a sidewalk, on the west side of 108th. Standing at the side of the road, I could feel the wind of the passing cars. There is nothing safe or practical about this particular stop. I understand that placement and siting of bus stops is more complex than the average person expects, but there is no justification for a stop as dangerous as this in the heart of a city. Only the bravest (or dimmest) of souls would dare to actually stand and wait for a bus at this stop. The message received by the rider, and I can’t imagine this is the intent of Metro, is “we don’t care about you, because we don’t have to.” This stop illustrates perfectly the gap in which bus stops fall. The environment of the bus stop is not the responsibility of Metro, they focus on location and frequency. The city isn’t in charge of the transit system and has no control over where they site a bus stop. Private property owners are under no obligation to provide a safe environment for transit infrastructure adjacent to their land. If we want more people to use our transit system, we must make the system welcome and accessible to all. The above stop, and the others in this series, illustrate the limited accessibility of Metro’s bus stops. More than just unwelcome, many are unusable, and improvements to the infrastructure must be made if we have any hope of encouraging broader use of the system. HAHA. Love it. But it’s true. This looks like next to my place at 96th and Burt Street. I have ridden it before also when my car was in for repairs. I stood on the other side of the street and crossed when the bus came. Agreed, Metro needs some improvement, but to suggest this stop represents the system as a whole is a little overboard. 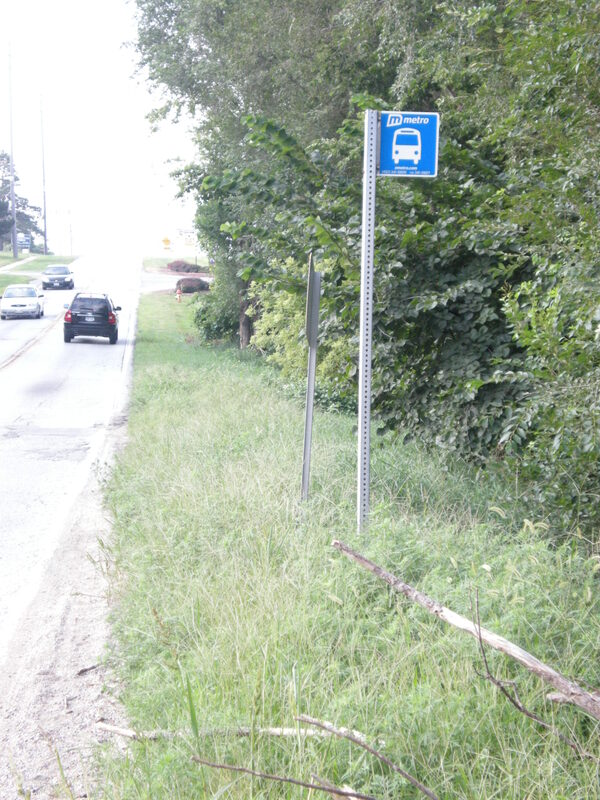 That stop is located in a suburban area on a two lane road that isn’t well-kept by the city. Metro wouldn’t be allowed to make that stop better if they wanted to. It’s up to the city to make improvements on its own land. Granted Metro could ask, but it all costs money. For Metro, it’s a question of “Provide this stop in the ditch, or don’t provide one at all?” Before we criticize the system we have, we must realize that us Omahans got the bus system we asked for when we decided to use nothing but our cars. Now we are looking for a better system and for our past negligence, we must dig up our system from the depths we drove (pun intended) it to. Metro Transit and The City of Omaha need to work together-unlike they do now-to create a safer and more appealing bus system. Nothing will happen if we point responsibility only at Metro. Good points. This is why the transportation master plan is so important. Can you make it to the next public meeting? Here’s more info: http://modeshiftomaha.org/2011/08/23/special-buses-and-bike-rides-to-the-sep-15-public-tmp-meeting/. I live out on 192nd and Harrison and there are no sidewalks or shoulders by the main streets. I wish our country was setup so that we paid more in state taxes than federal taxes. I think if that were the case then getting a better infrastructure in place would be more affordable/feasible. How great would it be if we could ride to work all the way downtown by bike. It seems that a large portion of the omaha work force lives out west but works downtown. I don’t have any statistics to back this but if you look at where the largest companies/organizations in omaha are located it supports this theory: Conagra, UP, Mutual of Omaha , First National Bank, UNMC and UNO. It would be great if we could all have the choice to walk or bike to work no matter where we live in Omaha. The transportation master plan addresses these issues but we need to encourage public support. We hope you can come to the Sep. 15 public priorities meeting to provide your input. More info about the meeting is here: http://modeshiftomaha.org/2011/08/23/special-buses-and-bike-rides-to-the-sep-15-public-tmp-meeting/. If you can’t attend, you can send comments here: http://www.ci.omaha.ne.us/tmplan/public-input.